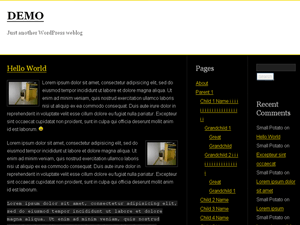 Description: A fluid 3-column, widget-ready theme. Total Liquidation is my first liquid/fluid width theme. Rather than just challenge myself creatively, I also want to learn more about creating fluid designs. That’s the area that I’m really lacking so I decided to try one today. This theme is image-less and very, very simple because I was afraid that I would get frustrated and give up if I had to convert a graphics-dependent design into a fluid theme. Total Liquidation isn’t much, but it might come in handy if you ever want a basic fluid theme to start off with.